Dubai, UAE: After the remarkable success of the launch edition of the Dubai Smartpreneur Competition which received 350 innovative business ideas, the Dubai Chamber of Commerce and Industry is launching the 2nd edition of the competition whose aim is to stimulate a culture of innovative entrepreneurship in the emirate. 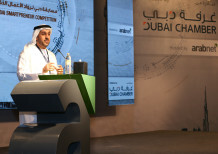 In the first session, Dubai Chamber received 350 entries out of which 48 qualified for the final phase of evaluation held under the supervision of a specialised committee of judges as the qualifiers attended two full day workshops on sector-specific training, mentorship, building relationships and developing a full business plan from experts in the field. Out of the 48, 10 shortlisted competitors were assessed for their innovative business ideas and three winners were selected who received a cash prize and the opportunity to join Tejar Dubai entrepreneurship development programme for a year to help them turn their business ideas into reality. The first prize went to Sebastian Stefan for his idea LoadMe.ae focusing on reducing traffic through GPS tracking and smart phone apps and the second prize winner was Craig Muyambo for his idea Efhamni (Understand Me), an application designed to bridge the gap between deaf and hearing people while the third prize was bagged by Murshed Mohamed, for his idea “i want” which is an on-demand platform that helps people buy anything on retailers’ shelves with the push of a button. Essa Al Zaabi, Senior Vice-President, Institutional Support Sector, Dubai Chamber, and General Coordinator of Tejar Dubai, stated that this latest session follows the highly successful launch edition which saw an overwhelming response from hundreds of aspiring entrepreneurs putting up creative business ideas which will definitely add value to the business environment of the emirate. “This second session will keep the momentum and lead to generating excellent business ideas while encouraging young entrepreneurs to participate in Dubai’s strategic initiatives and contribute to the emirate’s efforts of creating happiness by adopting innovative technology while transforming Dubai into a smart city,” said Al Zaabi. He further stressed that the Chamber strives to stimulate creativity and innovation in the private sector through various innovative programmes for enhancing customer happiness and as part of the UAE’s post-oil strategy for the growth of economic sectors and industries based on innovation and excellence. “Therefore, the Chamber is working with its partners to support this trend through initiatives like the Dubai Smartpreneur Competition which promotes smart business among young entrepreneurs,” said Al Zaabi. Sebastian Stephen, CEO of LoadMe.ae the first prize winner stated that the Dubai Smartpreneur Competition offered intense training sessions and professional help as the closing ceremony held during ArabNet Digital Summit 2016 provided good exposure to the portal and brought in new clients and potential investors for LoadMe.ae. Said Stephen, “I would advise young entrepreneurs to register for the next edition with an idea that can make Dubai smarter as the Smartpreneur Competition is the perfect environment to launch new ground-breaking projects. Murshed Mohammad, Co-Founder, Yebab.com whose idea “i want” won the third prize, said: “We were very excited to be selected among the top 3 projects out of more than 350 projects in Dubai. We worked hard to make “iwant” a reality and this confirmed that the project is very unique and adds value the way we believe it is. “We are changing the way retailers connect with customers to the better. The future is all about Artificial Intelligence and Conversational Commerce, and we are working on making “iwant” a leader in this field coming out of Dubai,” he said. In the first session of the competition, Dubai Chamber received 350 innovative ideas from over 40 countries around the world, out of which the UAE emerged the second largest with 60 ideas coming in while 81% of the ideas were submitted by men and 19% by women. Also, out of the top 10 qualifying ideas, four came from the UAE, 3 from India, and one each from Romania, Zimbabwe and the UK. The competition required that the ideas have to be developed on one of the following dimensions of the Dubai Smart City initiative including: Smart Economy, Smart Living, Smart Mobility, Smart Governance, Smart Environment, and Smart People. Here, the highest percentage of 28% was based on Smart Living dimension of the Smart Dubai City initiative, followed by Smart Economy (19%); Smart Mobility (17%); Smart People (15%); Smart Environment (14%) and Smart Governance (7%). All applications are evaluated based on the following criteria including the problem the business addresses in a large or growing market opportunity, if the idea has a value proposition and identifies customers’ need for the product or service in line with the market and competitive landscape and if it supports one of the Smart Dubai dimensions. Also, if the team demonstrates passion about their idea, and if they have a thorough and credible execution plan along with the idea’s Business Model, its revenue generation methods as well as its financial growth projections.